Starting any business tests every fiber of your being. Pioneering a new disruptive technology that requires a culture or behavioral shift is on a whole other level. The heights heady, the lows debilitating – and a roller coaster ride I wouldn’t trade in for anything. Every day as an entrepreneur I test my limits, face my fears, and embrace realities I cannot control. Through it all, there’s never a day that innovating and troubleshooting doesn’t push me to evolve my consciousness and align with my authentic truth and purpose. I'm a work in progress like anyone else, and I’m sharing here my eclectic epiphanies at the intersection of personal and business growth – as an innovator, strategic visionary, fun-loving maverick, problem-solver, author, mom, mentor, and true friend. My mission above all else is to enlighten, empower, and embolden you as a conscious leader to show up in your authentic power – in flow and fearlessness. And to guide you as you grow your business and launch your moonshots! I’ve learned that the Universe has a humble way of pushing you to your true and unique mission in life, and when you listen and align with that authentic purpose, you're given a Launchpad for greatness. Sometimes you must quiet the mind and listen closely for the signal; other times it can be brutal – a health scare, a breakup, a business that just doesn’t fly. But to hear it, you must be conscious, curious, open-minded, and open to seeing the opportunity in the challenge or setback. And we must learn to accept ourselves, even those shadowy things we don’t much like. It can be hard to do. “Mom, you’re enough”, my then 12-year-old daughter wrote to me a year or so ago. This radical insight moved to tears of intense joy. She and her brother have seen me struggle, as I built and led a succession of startups (some succeeding, big, others, um, not), suffered in a painful and verbally abusive marriage and the through a bitter divorce. Then they witnessed me grow as a person, learn to accept myself, find love again. Through it all tried my best day after day to provide for them, make them laugh, and teach them the things I never learned from school or my parents. Abundance mindset. Mindfulness. Financial independence. What it means to find our true purpose in life, and how to overcome fear, self-doubt, and our subconscious limiting beliefs. I’ve learned so much along the way. Life hacks, badass marketing moves and mindful mantras, innovative tech tips and ‘trep tactics – my life from my first memory of my grandmother calling me “disruptive” has been, well, full. I was a competitive figure skater with a knee injury that cut my career short at 15. I was an activist in college that co-led a movement that succeeded in getting my college McGill to divest its investments from apartheid era South Africa. I was an investigative journalist on the Times of London who almost brought down the government with a scoop on a financial scandal. I was a BBC and ABC News anchor and host who interviewed variously Steve Jobs, Yitzhak Rabin and Twiggy. I built an award-winning political news agency reporting on the local impacts of decisions made (or not, LOL) in the U.S. Congress – launching it when my daughter was only 6 weeks old, running around the Capitol with a microphone and a breast pump. I built and grew an interactive app to 3 million users in 8 months. I’ve innovated brain-bending algorithms to score the accuracy of crowd-sourced content and then to understand people from what they share in their social media conversations. Now, all these experiences and lessons are converging in a way that finally makes sense to me, helping me “connect the dots” about what it takes to succeed as a female entrepreneur, how to be heard above all the social noise and “infobesity”, and why businesses that do good for the world do better for their bottom lines. …One of them to invest in 100 female-founded and run scalable startups in the next 10 years. 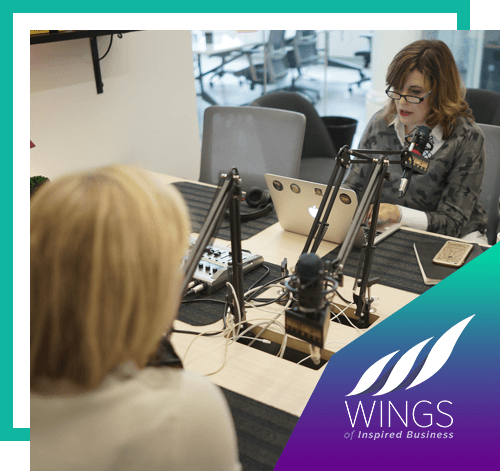 And that led me to interview hundreds of amazing women like Tina Sharkey, JJ Virgin, Kara Goldin, Lauren Flanagan, Sara Blakely, Candace Brown Elliot, Kay Koplowitz and many more for my book on female entrepreneurship – and now my daily podcast Wings of Inspired Business. Another to evolve my social intelligence company Verifeed in an exciting new way – helping entrepreneurs, experts and evolved brands achieve unrivaled impact and influence by “walking their talk” with authenticity on social media and personalizing their messaging at scale with an AI-driven “social engagement ‘Alexa’ in your pocket”. This, after seeing from our social sifting algorithms that brands and businesses that interacted with authenticity on social media to personally engage their customers, wildly outperform their rivals. I called it Return on Authenticity™, built the algorithmic ROA™ Score and Protocol, and now I’m delighting in seeing my clients get unprecedented results, whether in traffic, conversions, revenue, earnings or company valuation. As I learn to live a life of limitless possibilities and “walk my own talk” with authenticity, I’m eager to share all I’m learning on my journey. And I hope these pages inspire lively, thoughtful and thought-provoking conversation and connection. Her “moonshot” is to invest in 100 female-founded and run companies – and to BE the change she wants to see in the world by helping women worldwide to empower each other. 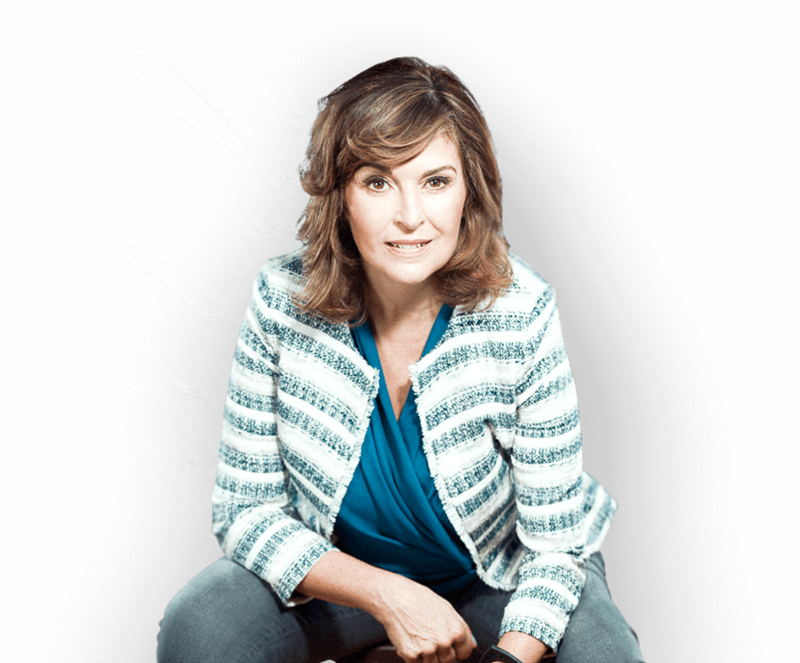 Melinda serves and collaborates with mission-driven innovators, thought leaders, and “evolved enterprise” companies that want to do well … by doing good. Melinda is a single mom with two amazing kids Sydney and Finn, and her beloved golden retriever Josie. She lives an “all in” life of endless curiosity – from her inner exploration of mindfulness, meditation and yoga to her world travels and “Maverick mayhem” with her tribe of awesome entrepreneurs. Interviewing Steve Jobs as a young financial reporter on The Times of London, the Apple founder told Melinda she "asked the best questions". "You're disruptive", her grandmother told the 5-year-old Melinda after she went door-to-door to get neighbors to pre-pay for her "show". Competing with her team in a Maverick "Amazing Race" around Sir Richard Branson's Necker Island, Melinda took a giant leap to the finishing line (a hot tub) and splashed ungracefully right next to the Virgin founder. She lead 60+ McGill students in an impromptu occupation of the administration building to get divestment from Apartheid South Africa on the Board of Governors agenda – and McGill was the first North American college to divest. She is a yoga fanatic who believes (fervently) that tequila is a pro-biotic. She loves dogs and once competed with her late golden retriever Pundit in dog agility. I’ve set out to avoid boredom, open myself to continual change, “give forward” to improve our world, and be “all in” on everything – and everyone – I choose to embrace. I was only 5 and all I knew was that I’d been out knocking door-to-door with my black lab asking people to “pre-pay” for my show. “You will be a PIONEER …”, she said, before the follow on, “it will be DIFFICULT”. No one's life is easy. True to prediction, I know I made it more difficult than necessary as I pushed myself to do things well beyond my fear zone. my college friends said to me when I suddenly announced I was moving to London to try to find work for a major national newspaper. my London journalist colleagues asked when I suddenly said I was going to leave print and become a TV anchor. my TV friends said when I decided to start one of my earliest businesses, Capitol News Connection. Live long enough and you start to see patterns in your life. Mission has always been my driver. In whatever role, my constant has been "change the world", be a catalyst for trusted connection and conscious leadership. I also know that success manifests from within, that a life well lived requires that we get out of our own way, beyond our inherited limiting beliefs, and that we harness mindfulness, gratitude, abundance thinking, and courageous creativity – all vital for business and personal growth. Steve Jobs once talked about the clarity about a life’s purpose when you look back with 2020 hindsight at all your seemingly disparate skills and interests. Mine now converge. At Verifeed I’m finding innovative ways to assure trusted connection and authentic interaction between individuals, thought leaders and businesses in a digital, social and increasingly “augmented” #AI world. Last year I spotted a trend in our social data, that is, within all the millions of conversations on social media that our algorithms at Verifeed analyze every day. It turns out that brands and businesses that "speak from the heart" to connect and interact with consumers in a genuinely human or authentic way ... wildly outperform their more "salesy" corporate-sounding rivals. And when they have a social mission or evolved enterprise, it gets even better. 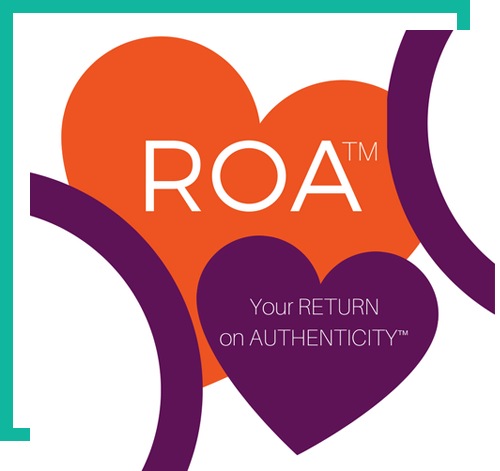 So I created ROA™ – that is, your Return on Authenticity™ – so anyone who wants to boost their influence and impact as a thought leader or trusted brand, can identify and understand their true “tribe” as individuals, and engage them with authentic personalized messaging at scale. It beats the vanity metrics of likes and hearts, and enables business owners to measure how their interactions boost engagement, traffic, conversions, social impact, and profit over time. Verifeed is my fourth startup company, and along the way I learned it’s a bit different for women entrepreneurs. It has proved hard for me and many other female founders to raise capital, and I want to change that. Blinkered VCs stuck in an outdated pattern recognition methodology are leaving too much opportunity on the table! A vocal supporter and mentor of women founders (and in encouraging girls to innovate in artificial intelligence, data science, AR/VR, robotics and more), I’m writing a book on female entrepreneurship. Informed by my own successes and failures and the insights of successful women founders of all generations, my goal is to empower and enlighten women as leaders so they can manifest the success of their dreams. The hundreds of women I have interviewed for my book and my podcast Wings of Inspired Business talk about having no female “SuperSheroes” to look up to. Back when I was 19 in college at McGill University launching her second business, Montreal’s first English-language entertainment listings magazine, there were no female role models for a budding entrepreneur. 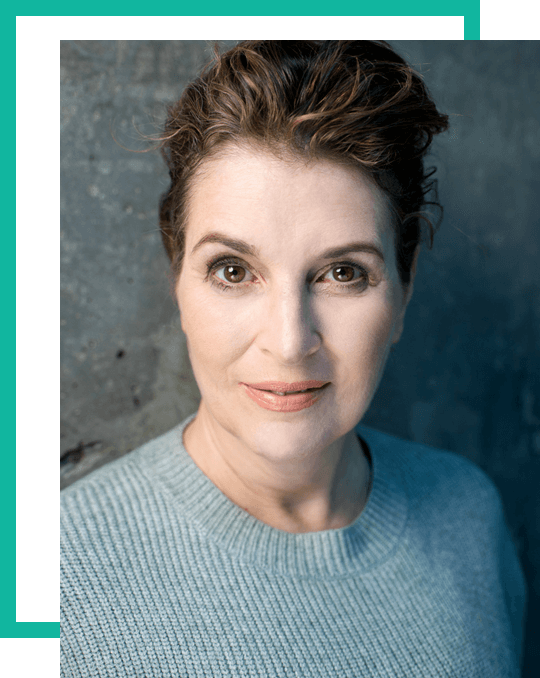 So I’m writing the book I wish I had had all those years ago – and affirming and acclaiming the entrepreneurial journeys of amazing women every day on my podcast. The lack of female role models may have been why I put entrepreneurship on hold after college to join the Times of London at age 22 as a correspondent writing about business and media. That/s where I first understood the power (and profit) of targeted information and insight, as well as pattern recognition, and I began moving financial markets with my predictive “superpowers”. Steve Jobs once told me I “asked the best questions”. All I really cared about was being first, right and predictive, so my questions were informed then as they are now by wanting to know where the story was going next, and how decisions and events impacted people and our world. I loved to learn from all the entrepreneurs and business leaders she interviewed, especially about this new thing called “the Internet”! From the Times, I moved into television as a news anchor and producer, first creating and hosting Financial Times daily business programming for CNBC in Europe and Asia. In London and then in New York, I was a news anchor and host for the BBC, MSNBC, and ABC News, where I co-anchored World News Now with Anderson Cooper. Inspired by my dual life in New York and London back then, I also created the BBC’s nightly news magazine USA Direct, growing its daily audience to 20 million. After the terrorist attacks of 9/11, I resolved to change the way politics was reported so that more citizens would take an active role in our democracy. "All politics IS local", I thought, and seeing early the value of customizing content to the circumstance or an individual or community, I created in 2002 the award-winning Capitol News Connection. CNC "localized" reporting of Congress for 200+ TV and radio stations, reaching an audience of 3 million daily. Enamored by the power of crowdsourcing and social networking and how it could transform news into interactive connection, I created the crowd-sourced app Ask Your Lawmaker, so citizens could question their elected representatives. It was awesome to be able to grow the app to more than 3 million users in just 8 months. 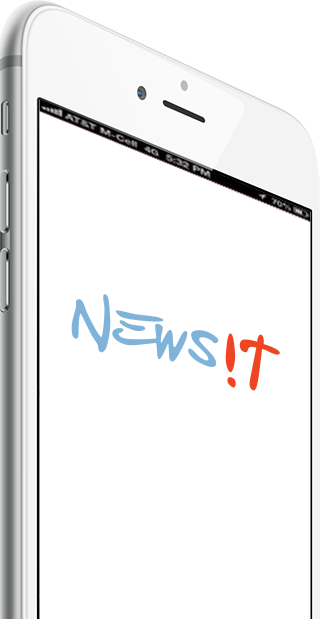 I went on from there to found NewsiT, a crowd-collaboration mobile app for people to create and share news around shared interests – and authenticate credible sources and fact check information. Marissa Mayer of Yahoo called NewsiT the “future of news” – but it was a bit “too future” to get the funding it needed to thrive. “What makes you think people will create content”, investors asked. “What makes you think mobile will be big”, they also asked. There is a big price to be paid in being too early! "If you are authentic, your company can do anything"
"Word of Mouth" is everthing: @reply to every person"
"Fly the plane as you are building it"
I've grown increasingly passionate about "conscious capitalism" and "evolved enterprise"
That is, brands and businesses that focus on social good and improving our world with “give forward” business models. When I was starting out, social causes and entrepreneurialism were a contradiction in terms, but now it is the only way: Our data at Verifeed proves you can do better by doing good. Verifeed gravitates to clients that have a social mission, and we donate a portion of all client revenue to causes and measurable social outcomes around the environment, education, women, sustainable growth and animal welfare. I’m a major donor to the Pachamama Alliance, protecting the Amazon Rainforest, the BVI “Art Reef” to support coral regeneration in the Caribbean, and now Hurricane relief efforts. I’m looking for ways to use my book and podcast to support women’s education and entrepreneurship in the developing world. Somewhere along the line I also became a juggler, metaphorically of course, as I integrate all this with being a mom to my two wonderful children, Sydney aged 14, and Finn aged 11 and my golden retriever “sensei” Josie. I’m a total yoga fanatic (Bikram and Ashtanga) and a believer in daily meditation, mindfulness and gratitude. I love to travel too, and I’ve been all over the map, including the Guatemalan and Egyptian pyramids and Amazon rainforest where I spent two illuminating and inspiring weeks with the remote Achuar tribe. If you’re a friend on Facebook you will have seen my adventures as well as my Maverick shenanigans, whether dressing up as a “space babe” (with a bad wig) on Sir Richard Branson’s Necker Island, running an Amazing Race in Buenos Aires, or dressing up in crazy costumes at Maverick summer camp for entrepreneurs. To me, life is about being in the moment – and having fun. Get updates on new articles, podcasts and other opportunities.